After Marshall retired in 1897, successive heads of the Shanghai office of the Office of Works were William Cowan, until his death in 1906; Cecil J.W. Simpson, Cowan’s former assistant, who returned to London in 1912 or 1913; and Herbert Ashmead, for a couple of years before the First World War. Julius Bradley served from 1914 until 1928; succeeded by Thomas Terrace (in an acting capacity) until 1933, when James Wynnes, fresh from completing the reconstruction of the Tokyo compound, took over until 1938. Finally, Thomas Terrace served, with a break during the Second World War, from 1938 until 1950, when the office moved to Hong Kong, where it remained until the 1980s. The size of the office appears to have been fairly constant throughout its life in Shanghai: the surveyor/architect at its head, one or two professional assistants, several clerks of works, and a draughtsman/clerk (in the early years, C.P.M. Donaldson, the son of a clerk of works). Among the Office of Works personnel who served in the Shanghai office, apart from the heads, were, in approximate order of their postings, Henry A. Collins, A. Bulloch, W. Power, W. Harris, R.C. Groves, W. D’Harty, B.H. Tarrant, J.M. Davidson, R.C. Groves, S. Cameron, A. Scott, W.J. Roberts, H.M. Spence, W.G.E. Jones, H.R. Lane, J.E.R.G. Keen, J.C. Clavering, and J.A. Douglas. Although Kiungchow, on Hainan Island, was designated a treaty port in 1858, it transpired that the small port that served it, Hoihow, about three miles to its north, would make a less unpromising place to establish a consulate. It was therefore at Hoihow that a vice-consulate opened in 1876, housed in a sequence of extremely unsuitable temporary premises on the waterfront. A site on which to build, known as the Fort Egeria site, was rented in 1894 on Cocoa Nut Islet but access to it was so ill-maintained by the local authorities that it became useless. 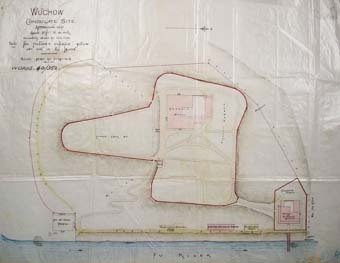 Seven lots of land were instead bought in 1897, just to the west of Hoihow, to form a site, for which Marshall prepared designs shortly before his retirement. Cowan executed them and the consul’s wife laid the foundation stone in November 1898. 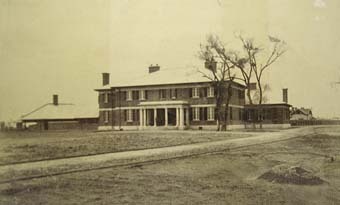 During construction, an adjacent site was acquired for constable’s quarters: both buildings were completed in 1900. China accepted a British consular officer at Chungking, a river port fourteen hundred miles up the Yangtze, in 1877. The port, however, was only opened to foreign trade in 1891 and steam boats were not allowed so far up the river until 1896. The old city lies along a huge limestone tongue between the Yangtze and Kia-Ling rivers. Early consular officers, who spent a great deal of their time travelling in the south and west of China, rented a native house in the middle of the city and were allowed by the Treasury to counterbalance its unhealthy milieu by building in 1898 a bungalow in the hills at Liang Fen Yu, about two miles south on the other side of the river. A perpetual lease for a permanent consular residence and offices was not signed until 1896, on a site near the West Gate. 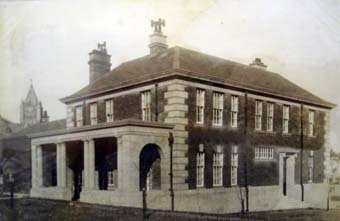 Cowan designed and built a two-storey consul’s house with offices and adjacent constable’s quarters and gaol, both completed in 1900. 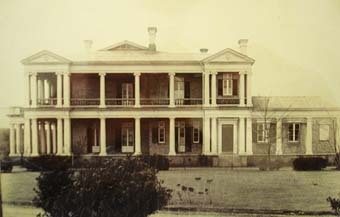 The site was enlarged by the purchase in 1904 of two adjacent lots, to bring the compound up to about five acres in all. A site for a consulate at Wuchow was acquired in 1898 by perpetual lease: unusually for a river port, it was not on the bank but on the top of a hill on the west side of the Fu-Ho and West River junction. The lessors were the local gentry and owners of graves (which were subsequently removed). Another small piece of land was added later. 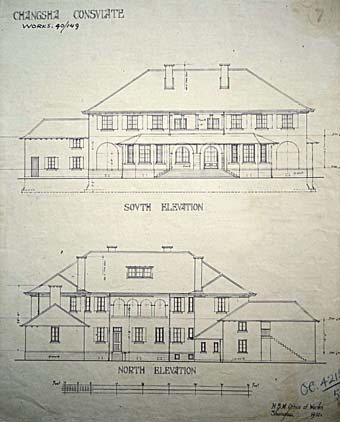 In 1900, Cowan completed a consul’s bungalow on the hilltop and a two-storey building for offices and constable’s quarter near the bottom, with extensive steps between the two. The opening of Nanking to foreigners, envisaged since 1858, did not occur until 1899. A consulate was established there in 1900, at the height of the Boxer troubles in the north. A perpetual lease of a three acre site within the city walls was bought in 1901, and Simpson completed a consul’s house and offices on it in 1906. In 1910, a small piece of land adjoining the south-east corner was bought, and Bradley built constables’ quarters and gaol on it in 1921. In 1920, the site to the west was bought and more offices and a vice-consul’s house built on it soon afterwards. An unsuitable site close to the police station in the foreign settlement at Hangchow was acquired by a consul, against Cowan’s advice, and, since it needed a great deal of filling to bring it above flood level, was later sold. A much more promising site for the consulate was bought in 1897 on the opposite bank of the Grand Canal to the settlement and custom house sites, about six miles north of the city. Cowan completed a consular house and offices on this site in 1901. At Ichang, an adjacent site was bought in 1905 for separate offices and a constable’s quarters, which were built soon afterwards. The offices were destroyed by fire in January 1918 and new free-standing single-storey offices were completed by Bradley by 1921. At Mukden, the capital of Manchuria, a five-acre site was acquired in three lots in 1908 and 1910 on land outside the west gate of Fengtian.. Simpson completed a consul-general’s house with offices in 1910. Dairen, at the southern tip of Manchuria, was variously a Chinese, Japanese and Russian naval arsenal and stronghold. A consular post was established in 1907 and a one acre piece of land, facing the Central Circle, was leased to the British government for 50 years. A consulate, probably designed by Simpson, was completed on the site in 1914. A consulate was opened at Changsha, on the Hsiang river, in 1905. The first consul lived at first in a houseboat and then in a dilapidated house. A two acre consular site on the narrow island in the middle of the river was leased in perpetuity in 1909, and an adjacent 1½ acres in 1911. Simpson completed a two-storey consul’s house and offices in 1912. The consulate at Tsinan, a port on the Yellow River, was established in 1906 primarily to keep an eye on German designs in Shantung. As a result of the British government withholding recognition of the Regulations that were drawn up in 1905 for the international settlement, the consulate had perforce to lease its accommodation. In 1917, however, the consul was granted a 14 year lease on a three acre parcel of ‘Fourth Class Land’ in the south-east corner of the settlement. Here Bradley completed a two-storey consulate building with offices in 1918. 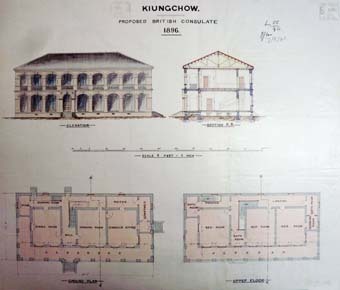 Marshall’s 1896 design for the consul’s house and office at Hoihow (instead of Kiungchow). The consul’s house and office at Chungking, designed by William Cowan and completed in 1900. The Wuchow consular site with the consul’s house on the hilltop and the offices with the constable’s quarters down on the river bank. The one storey residence that Cowan built for Wuchow. 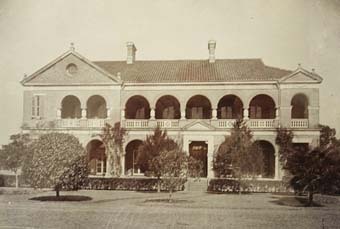 The consul’s residence and offices at Nanking, designed by Cecil Simpson and built in 1906. 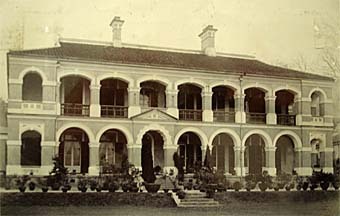 The consul’s house and offices at Hangchow, built by Cowan in 1901. 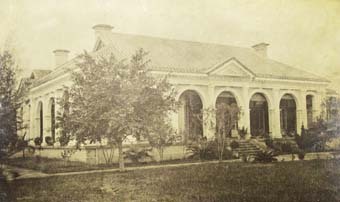 The consul’s house and offices at Mukden, built by Simpson in 1910. 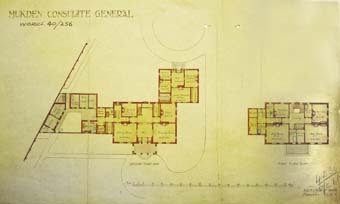 1910 plan of Mukden consul’s house. The offices are in the rear single storey wing, with separate entrance. The consul reaches his office from his study in the house. The consul’s house and offices at Dairen, built by the Shanghai office in 1914. 1910 drawing for the consul’s house and offices at Changsha.